As excited as we are for the start of the 2016 NFL season, especially since it means we get to see how well the top-tier rookies adapt to the speed of the pro game, it's important to remember one key piece of information: College football is still filled with boatloads of talent. With the 2016 college football season fast approaching, every major program should have its eyes firmly on the prize. In the end, it's all about winning a national championship. However, just because the focus should always be team-oriented, that doesn't mean players aren't striving for their own form of individual glory. At the college level, one honor stands above the rest: the Heisman Trophy. Throughout the course of the season, we're sure plenty of contenders will be in the running to win this award. However, just because there's some time before opening kickoff, that hasn't prevented oddsmakers from compiling a list of early favorites. Here's a look at who Vegas is picking to win the 2016 Heisman Trophy. 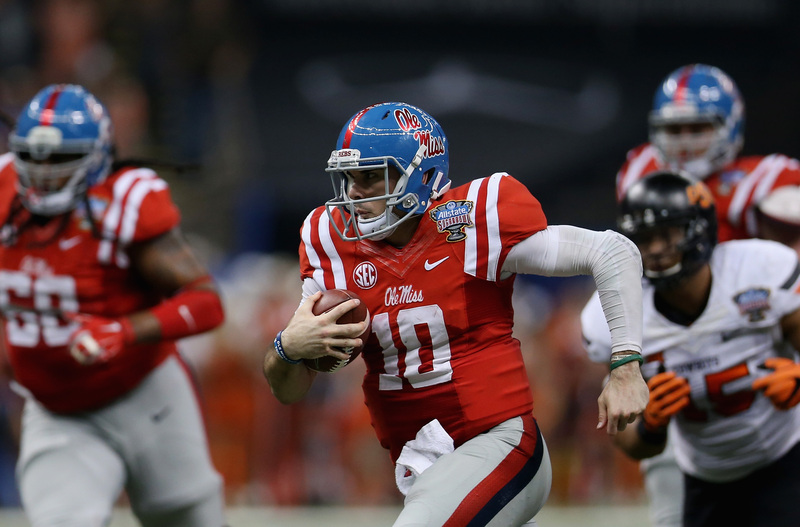 After declaring himself the "best quarterback in the nation," it's clear that Ole Miss's Chad Kelly certainly doesn't lack confidence. Sure, some will find this proclamation to be a bit on the arrogant side, but after a 2015 campaign that saw Kelly complete 65.1% of his passes for 4,042 yards, 31 touchdowns, and just 13 interceptions, we think he has every right to feel good about his skills. It would appear Vegas feels the same way. Now that Cardale Jones and Ezekiel Elliott have moved on to the NFL, the Ohio State Buckeyes are officially J.T. Barrett's team. While splitting time at quarterback last season may have cost him a chance at putting up massive numbers, if the soon-to-be junior can manage to replicate his showing from his first year (2014) in Columbus (2,834 passing yards, 34 touchdowns, 10 interception; 938 rushing yards, 11 rushing touchdowns), he has as good a chance as anyone in the country to win the prestigious Heisman Trophy. The only thing more surprising than Oklahoma playing in last year's College Football Playoff was quarterback Baker Mayfield's ascension to superstardom. Yet, in his first season under center for the Sooners (after sitting out a year following a transfer from Texas Tech in 2013), that's exactly what he did. The man with the moves completed 68.1% of his passes while throwing for 3,700 yards, 36 touchdowns, and just seven interceptions. He also rushed for 405 yards and added another seven scores with his legs. All this led to Mayfield finishing fourth in last year's Heisman Trophy voting. Perhaps 2016 will be his year. In 2015, Florida State running back Dalvin Cook finished seventh in the Heisman Trophy voting. Given hisoverall production, he probably should've finished higher. Cook led the ACC in rushing yards (1,691), rushing touchdowns (19), and total yards from scrimmage (1,935) — and he was just a sophomore. Barring any setbacks from the shoulder surgery he had in April, we fully expect Cook to challenge for the nation's most prestigious individual honor. At one point last year, it appeared as if LSU's Leonard Fournette was going to run away with the Heisman Trophy. Unfortunately, as the Tigers began to plummet in the polls, so did the All-American back's chances of taking home the game's top individual prize. Still, he did manage to rush for 1,953 yards (second in the SEC) and 22 touchdowns (second in the SEC) and finish sixth in the final voting. After a showing like that in 2015, clearly Vegas thinks he has what it takes to get the job done in 2016. 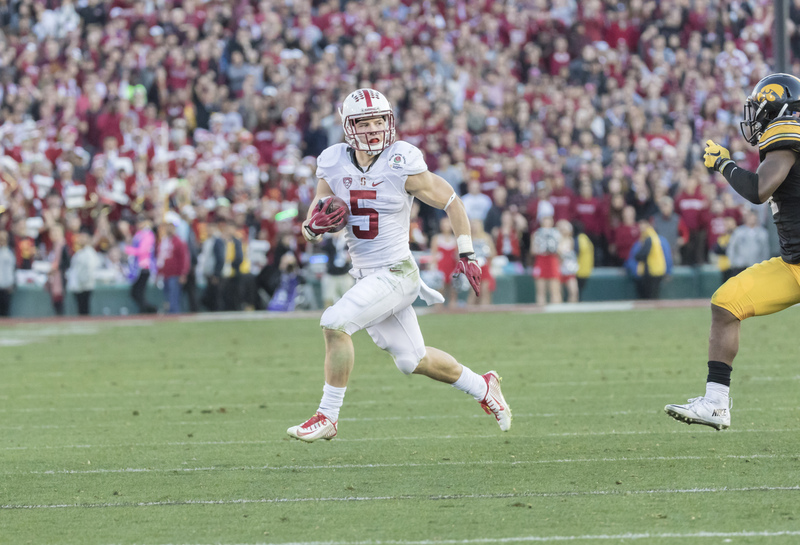 There are many who believe that Stanford running back Christian McCaffrey should've won last year's Heisman Trophy instead of finishing as the runner-up. It's hard to argue with these individuals. In 2015, aside from rushing for 2,019 yards (first in the Pac-12), compiling 1,070 kick0ff return yards (first in the Pac-12), and leading the country with 2,664 yards from scrimmage, McCaffrey also broke Barry Sanders' 1988 record for the most all-purpose yards in a single season. Will the All-American be able to provide the country with an encore performance in 2016? It wouldn't surprise us. You can't discuss possible Heisman Trophy winners and not include Clemson's Deshaun Watson. In 2015, hethrew for 4,109 yards and 35 touchdowns while rushing for another 1,105 yards and 12 scores, and quickly established himself as one of the nation's best and most exciting players. 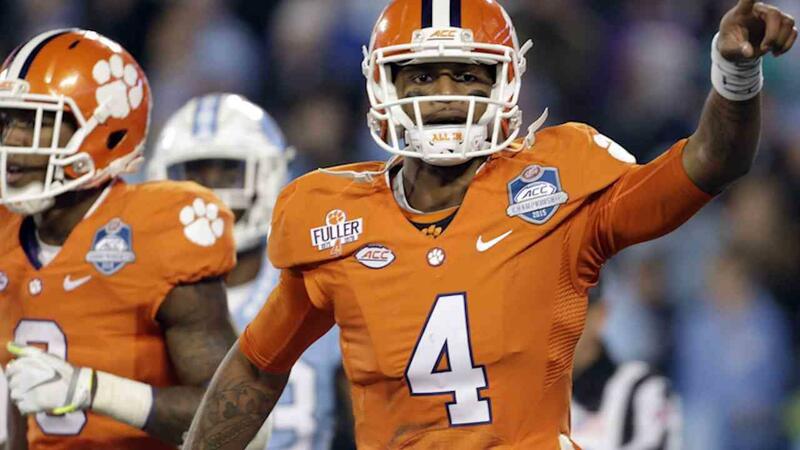 After finishing third in last year's voting and falling short in the CFP National Championship Game, you better believe Watson will be poised to attack 2016 with a vengeance. And who knows, when it's all said and done, perhaps he'll be the one striking that famous pose. NCAA: Just How Much Money Does the SEC Bring In?